THE WRITING BUDDHA - Opinions | Books | Movies: THE CRUEL EXPERIENCES of HARBOUR-LINE MUMBAI LOCAL COMMUTERS!!! THE CRUEL EXPERIENCES of HARBOUR-LINE MUMBAI LOCAL COMMUTERS!!! I remember the railway budget of our new government and the big promises made during the parliamentary session last year. Even bullet trains were planned, discussed and promised in the coming years. But seeing the condition of railway, basically talking about Mumbai Local, I am disappointed. The execution and approach is same as last decade and no new improvement can be seen- Either in punctuality of the trains, the condition of the coaches, the quality of announcement at the stations or any kind of initiative. I am a regular passenger of Harbour line and I am just too frustrated now considering how railway department have completely ignored this side of commuters. Whenever there's any kind of new local trains introduced, it is for Western line. When it gets little older after continuous run of almost a decade, it is demoted to Central line. And after the train is on the verge of breaking in middle of the journey, it is transferred on Harbour line. 6 years back when I shifted to Navi Mumbai, I remember I used to sit at window seat easily even when I caught the train at the last minute when it began its journey from Panvel. It was all okay then. The crowd wasn't uncontrollable until train reached Chembur. But these days, the train gets almost full in Panvel itself. After it reaches Mansarowar which is just 2 stations from the starting point, Panvel, the train gets crowded. And by the time it reaches the 3rd station, Kharghar, it is not possible to even try to get into the train. But the desperation and helplessness of commuters make them keep getting into this train which is already over its capacity in its first 3 stops only. Only I know how I get down at Vashi station every morning for my office. I am not asking much from Government like some ever complaining citizens. I am just asking for basic plans for this route during office hours. Rest you keep running your trains as you want during the whole day because the crowd isn't uncontrollable from 10.30 AM to 5.30 PM. But there should be a good frequency of trains between 7.30 AM to 9.30 AM and 6 PM to 8 PM in the evening. If you'll run train at 12 minutes during these peak hours, there will be crowd obviously. The number of housing projects that have been completed in Navi Mumbai in last 5 years have made lots of people migrate in this region of Mumbai which you consider outskirts that does not need as much attention as Western Line and Central Line. As you can notice, the gap between every train leaving for CST from Panvel is of 12 minutes. At one point of time it's almost 20 minutes as a ladies special is running in between in which men does not have a single bogie to enter. Out of all these trains, not even a single FAST local is planned. Except one UP and one DOWN for Panvel and Thane, not a single fast local runs from Panvel to any station THROUGHOUT the DAY. Not a single train is planned up to Vashi so that the crowd gets distributed and there's a little air to breathe for the commuters standing and cursing their situation in the coaches. And I do not think out of all the trains I have mentioned above, any of them are 12 coaches except 1 or 2. In 9 coaches that we regularly have, 2 of them are first class which is again distributed between Ladies and Gents. 1.5 are 2nd Class- Ladies coaches. 0.5 coach is luggage department. So, in the end, only 5 coaches are General coaches which is meant for regular commuters. I got myself a first class pass but I have never enjoyed an okay amount of crowd except on Bakri-Eid when it was a national holiday but unfortunately, I had to go for my job. Every day, I have to stand besides door for half an hour and even after that it becomes a big task to get down at Vashi because of rush and crowd. Even at the door, people stand in 2-3 layers because of which accidents take place. No one dares to leave the train for the next because as we can see, it's almost after 12 minutes which leads to either late-entry at office or the person misses the connecting train that he has to catch either at Kurla or Wadala. Similarly in evening, the cruel plan executed by the railway department is sad and shameful. I'll discuss about what happens when I am returning back from Vashi to Panvel. And let me tell the non-Mumbaikars, Vashi is the first stop of Navi Mumbai when you come towards Navi Mumbai from Mumbai (CST, Andheri, Wadala etc). Again as you can see, there is almost the difference of at least 10 minutes in each train that takes you to the last stop, Panvel. The only train that is little less over crowded is 6.25 and 7.17 which you can think of catching and reaching up to the place in the coach where seats are. Still you can not think of getting a seat easily because people from CST who had to halt in Panvel have already got a seat by the time train reached Vashi. And let me tell you, these gaps of 10 minutes are enough for people to accumulate on the platform as everyone is back from office at the same time. Over this, there are other trains like Thane to Vashi, CST to Vashi, Wadala to Vashi which leads to double crowd as these people have to catch the trains to reach Panvel now. And the train for Panvel does not come until and unless these trains do not reach Vashi just because railway can't see any train running smoothly with its original capacity. The various trains in between that you see for Belapur is again a bane. To avoid the crowd of Vashi, some Panvel people do enter this so that they will catch another train from Belapur which will be pretty easy. 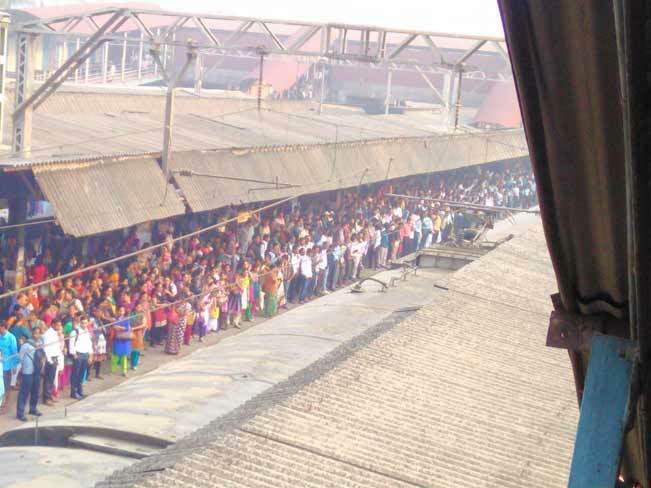 And similar situation occurs even at Belapur and when this crowd enters the train, the people who were already struggling after getting in at Vashi, faces this big crowd again who reached Belapur by a train that left the station 5 minutes ago. And all of this is not the end, the real story is that none of these trains are on right time. Mumbai Local was once known for its punctuality. Now, it's very obvious for me to find 6.35- Panvel on indicator at Vashi when it's already 6.50 in Railway's big clock fitted at various places on each station. So if a newly migrated person reaches Vashi at 6.50 and waits for the indicator to show him 6.53 Belapur, he will die out of panic when he'll see 6.35 Panvel on board. Trains at the frequency of 4-5 minutes can be easily scheduled as we can see 8.36 AM Wadala and 8.40 AM CST are running smoothly everyday. Even in the evening, 7.13 PM Panvel and 7.17 PM Panvel from Vashi are also running smoothly. 3-4 trains every hour between 5 PM to 8 PM can be run between Vashi to Panvel only so that this crowd also gets a seat and reach their home without getting tired and frustrated. Similarly, in morning, 3-4 trains can be planned till Vashi. Make the traveling of people within Navi Mumbai little easier. Also, please get some trains in good condition even on this line. We are also as much important as those people catching Andheri to Churchgate everyday. I'm a Fresher and work at office is much easier for me even when I am new in this corporate environment when compared to this journey of just half an hour twice in a day. Just imagine what senior citizens and people in 45-60 age group suffers every day for almost 1.45 hours (Panvel-CST) twice. If Suresh Prabhu, Devendra Fadnavis and Narendra Modi ever reads or get to know about this, please execute this before bringing bullet trains to India. Get your basics right first. Rest can happen even after 50 years. PLEASE!